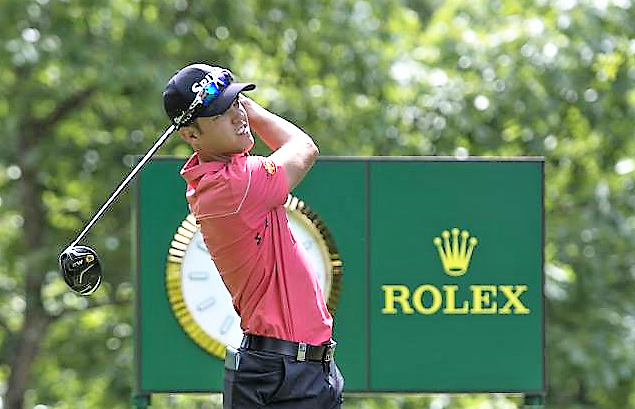 Borja Virto, pictured above by courtesy of Rolex/Phil Shephard-Lewis, moved into the outright lead on the second day of the Rolex Trophy, carding a second successive round of 66 to top the leaderboard on 12 under par at Golf Club de Genève. The Spaniard shared top spot after Round One but, for the second day in a row, six birdies and an eagle outweighed a couple of dropped shots as he finished Day 2 one shot ahead of Adrien Saddier. Virto, twice a winner on the European Challenge Tour on his way to graduating in 2015, has had a mixed season so far and he is keen to improve on his Road to Oman Ranking of 51st. “I’m feeling really good, really happy,” said the 26 year old. “My game was really good again and I had a nice finish, with an eagle on the eighth and a good two-putt on nine after over-hitting the first one. “I actually played really well today again, similar to yesterday. I had a good start, holing a bunker shot on the 11th for a birdie, and I just played really steady for most of the round." Virto’s nearest challenger is Saddier after the Frenchman fired the round of the week, an outstanding nine under par 63 that required only 29 shots on his inward nine after he started on the tenth hole. Saddier’s compatriot Julien Guerrier, the highest-ranked player in the exclusive 42-man field this week, would have been confident after his 64 today before Saddier’s afternoon delight.